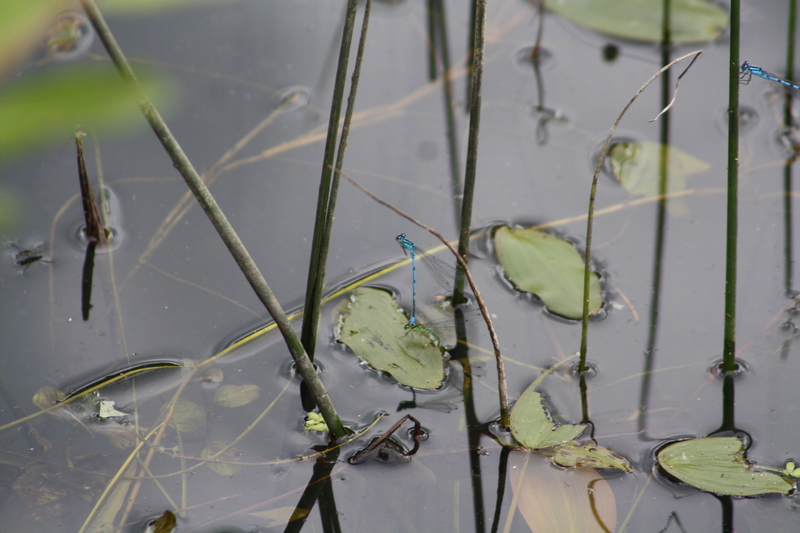 Dragonflies are some of my favourite creatures and today we decided to try and find some. As soon as we reached Reffley Reservoir this morning, we noticed a largish blue dragonfly flying a few feet above the water in the first section. It went back and forth along the length of the water and also criss-crossed from side to side. It was moving quickly and I had a job to focus on it with the binoculars. It seemed to be flying with a down curved abdomen, which can indicate an emperor, the biggest of the British dragonflies. 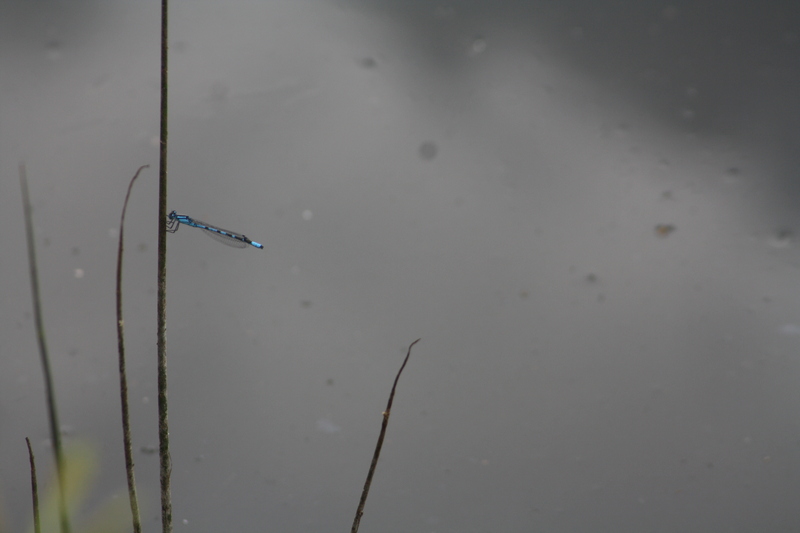 At one point, there were two of these dragonflies about. Frustratingly, I wasn’t able to make a positive identification and a photo I took was pretty blurry! Then they seemed to disappear. Later, I spotted a dragonfly in this area that seemed to be smaller and possibly darker. I saw it turn towards the bankside and it seemed to hover there for a few seconds. There were quite a few damselflies around over the water and over the grassy bank and I had more success getting a look at them. Some of them stopped to perch on plant stems. There was at least one pair flying together, or “in tandem” and I watched one couple ovipositing. The male held on to the female near her head as she dipped her abdomen in the water and laid eggs round plants. A damselfly perching on a plant stem. 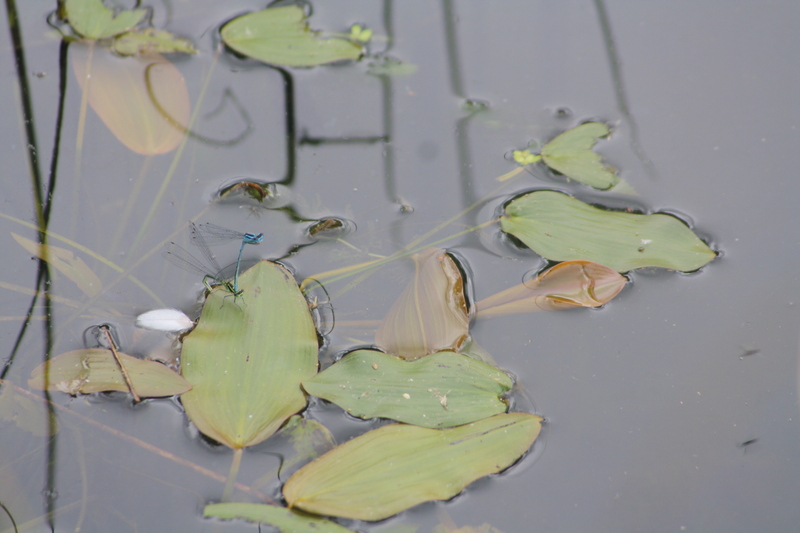 A pair of damselflies ovipositing and one perched. There were some butterflies about, mostly dark ones, which we thought could be ringlets. However, the weather was by then quite warm and the butterflies didn’t seem to want to settle! 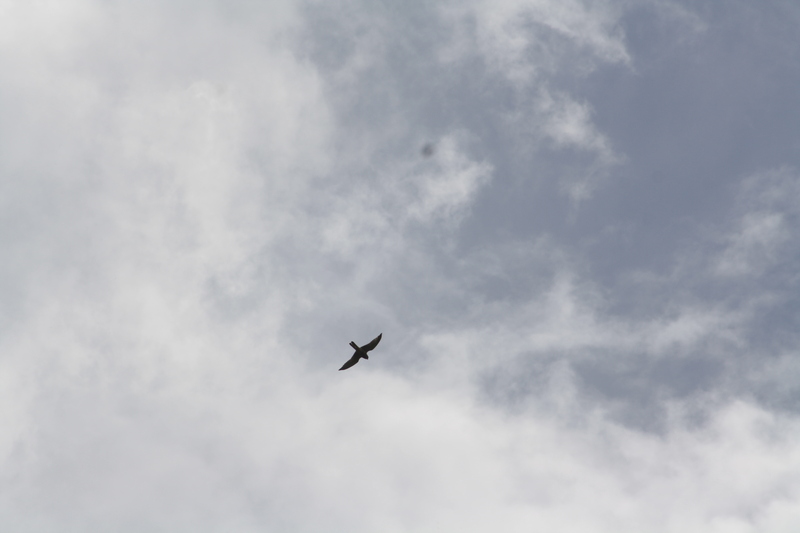 A bonus came in the shape of a bird hovering high in the sky at the opposite end of the reservoir – a kestrel! It flew away over nearby grassland, disappeared amongst it, but returned and continued to fly around for a few minutes over the other end of the reservoir. It was good to see the kestrel. Some swifts put in an appearance and two adult coots swam into view and started feeding. As for the dragonflies, I shall have to continue with my detective work and see if I can find out which species they are! Quite a few different ones should be on the wing now!